Pennsylvania & Beyond Travel Blog: My Top 7 Reasons Why I love The Beaches In Wildwood New Jersey! My Top 7 Reasons Why I love The Beaches In Wildwood New Jersey! Looking for a great beach to visit in New Jersey? If so, I highly recommend the North Wildwood, Wildwood and Wildwood Crest beaches because they are very clean, large and best part of all...they are free! A lot of New Jersey beaches have fees for you to even stick your toes onto them but...the Wildwood Beaches are totally free! I have visited at least 10 different New Jersey beaches in my lifetime...but I always go back to North Wildwood. If you ask my hubby he will tell you that I would rather vacation in North Wildwood then go any where else on earth...I just love it there! Here is why I prefer the Wildwood N.J. beaches over other beaches at the Jersey Shore. 1. They are super clean! They are not trashed up or rocky. They are super smooth and clean beaches that are cleaned and maintained on a daily basis. 2. They are large! I really dislike beaches that are so small that you have to crowd in to even get a spot. This is not the case in Wildwood. Their beaches are large white sandy beaches with a ton of room. 3. I have visited beaches where you had to hunt high and low for restrooms...this is not the case in Wildwood. They have nice clean restrooms every couple of blocks along the beach and these restrooms are free. 4. Parking can be a real bear and a nightmare at other locations. You can find parking by parking meter or you can pay $5.00 to $10.00 a day for lot parking near your favorite location on the beach. (we always stay in a beach front hotel so parking is not an issue for us). 5. 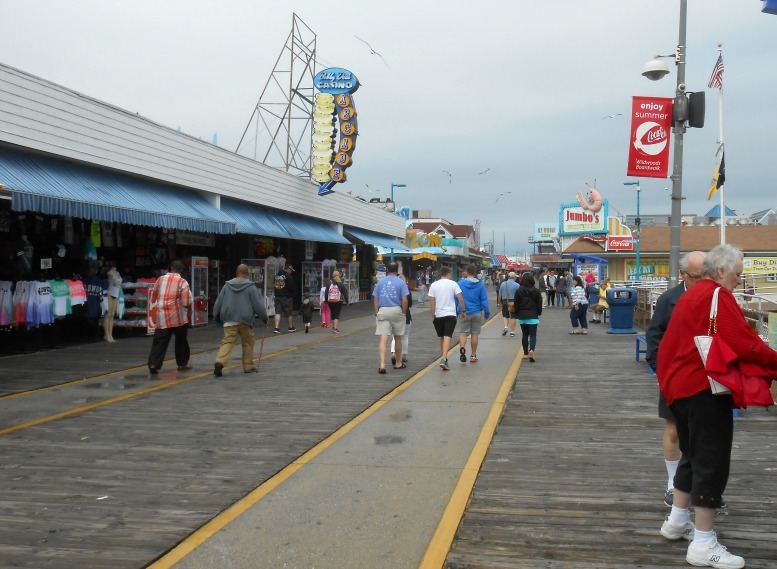 The boardwalk runs from North Wildwood, Wildwood and down to Wildwood Crest. There are a ton of great places to eat at, shop at and of course...a lot of great entertainment spots too. If you like Amusement rides...they got a slew of those too! 6. Great lifeguard staffing. They have plenty of lifeguards and first aid stops along their beach front to help keep you and your family safe. 7. Lodging in Wildwood is totally affordable and you have a lot of great lodging choices. I like other beaches but I have not found any that are as affordable for oceanfront accommodations like I do in Wildwood. As you can see...Wildwood is my Top Vacation Destination if you are hitting the Jersey Shore! Plus, if you have a rainy day, you'll find a ton of great rainy-day activities for you and the family to enjoy too! You can visit the Aviation Museum at the Cape May Airport, go shopping in hundreds of different stores, visit the Doo-Wop Museum, the Cape May County Museum, go to the Movies and so much more!